Provides a compact light weight infinity display at a fraction of the usual cost. 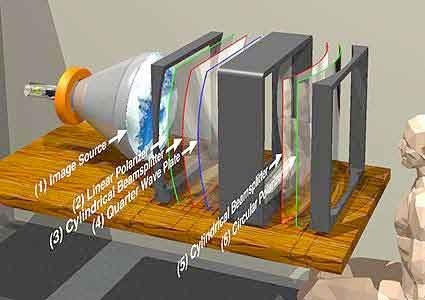 Infinity optics create an apparent image of a display device (CRT, etc.) which makes it appear to be an infinitely-distant scene, through a window. Infinity optics are traditionally used in multi-million dollar flight simulators for training military and commercial pilots. Catadioptric infinity displays which use beamsplitters and polarizers, have the advantage of being extremely thin. 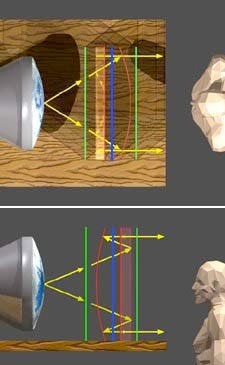 Conventional expensive catadioptric infinity displays use one spherical beamsplitter, and one flat beamsplitter which is made thick enough to withstand the mechanical shock of flight simulators. The $70,000+ cost of a conventional infinity display is primarily due to the cost of grinding and polishing the spherical beamsplitter. The patented HinesLab catadioptric Cylindrical Infinity Display uses innovative cylindrical optics to separately focus horizontal and vertical rays from the curved screen. The Cylindrical Infinity Display retains the optical efficiency of spherical windows, and eliminates the cost of ground-and-polished optics by bending flat beamsplitters to the correct curvature. Cylindrical beamsplitters are inherently strong due to their curvature, and are a fraction of the weight of conventional spherical and plane beamsplitters. The reduction in weight translates into better response time in flight simulators, improved simulation for the pilot, and a further reduction of system cost. Colors in the chart correspond to parts in drawing below. In all preceding diagrams, the optical elements are shown spaced apart for clarity. 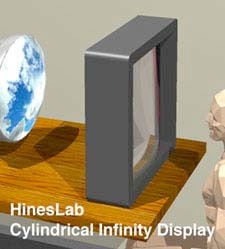 In constructing the HinesLab Cylindrical Infinity Display, the flat optical elements are clamped in a frame which bends the elements into the correct shape. Virtually all internal reflections are eliminated by laminating the five optical elements into two groups, improving the optical signal-to-noise ratio. This is a further advantage not available in the conventional spherical infinity window. The HinesLab Cylindrical Infinity Display can be made at a price for entertainment applications, such as in theme parks and arcade games. If you are tired of getting 40-year old technology and paying Star Wars prices, contact HinesLab about the latest in infinity displays. Technology licenses are available. Hines’ original laboratory notebook entries for this invention.